331- Honda CRF-100F 04-2013, 428 Conversion for Z-50, ATC-70 CT-70 CR-80, XR-80. Standard is 420 chain, our part 321. 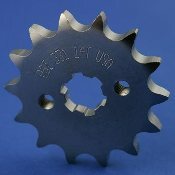 Note: When the tooth size is smaller then the stock size, a circlip will be supplied to hold the sprockets on the shaft. Affected tooth sizes for this part is 11-13 teeth.